Read the enclosed leaflet carefully before use. Dosage: For oral use. Massage the sachet before opening to mix the contents. A double ended spoon is provided to measure doses of 2.5 ml and 5 ml. Each sachet contains 5 ml of Calprofen. When dosing 2.5 ml throw away the remainder left in the sachet after use. Post-immunisation fever: Half a sachet (2.5 ml), followed by another half a sachet (2.5 ml) six hours later if necessary. Do not give more than 2 doses in 24 hours. If fever is not reduced you should consult your doctor. For Pain and Fever Relief: Age: Babies under 3 months; Dose: Not recommended. Age: 3 months-6 months (weighing over 5 kg); Dose: Half a sachet (2.5 ml) 3 times a day. Do not use for more than 24 hours. Age: 6 months-12 months; Dose: Half a sachet (2.5 ml) 3 times a day Age: 1 year-2 years; Dose: Half a sachet (2.5 ml) 3 to 4 times a day Age: 3 years-7 years; Dose: One 5 ml sachet 3 to 4 times a day Age: 8 years-12 years; Dose: Two 5 ml sachets 3 to 4 times a day Doses should usually be given every 6 - 8 hours, leave at least 4 hours between doses. For short term use only. Do not give to babies aged 3-5 months for more than 24 hours. Do not give to children aged 6 months and older for more than 3 days. If symptoms persist or worsen, consult your doctor promptly. This product is intended for use in children aged 3 months to 12 years. Not recommended for children under 3 months. Do not exceed the stated dose. 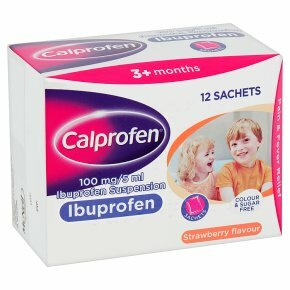 Do not give this product if your baby or child<br>Has (or has had two or more episodes of) a stomach ulcer, perforation or bleeding.<br>Is allergic to Ibuprofen or any other ingredient of the product, aspirin or other related painkillers.<br>Is taking other NSAID painkillers, or aspirin with a daily dose above 75 mg.<br><br>Speak to a pharmacist or your doctor before giving this product if your baby or child<br>Has or has had asthma, diabetes, high cholesterol, high blood pressure, a stroke, heart, liver, kidney or bowel problems.<br><br>If you are an adult taking this product you should not take this product in the last 3 months of pregnancy and you should contact your doctor or pharmacist before taking it in the first 6 months of pregnancy, if you are trying to get pregnant, if you are elderly or if you are a smoker.<br><br>KEEP ALL MEDICINES OUT OF THE REACH AND SIGHT OF CHILDREN.